Challenging yourself has never looked, felt or tasted so good! On an Iconic Journey, you experience so many miles beneath your wheels and so many more moments to treasure for forever, as every day transforms into another thrilling cycling experience. The ultimate road cycling tour in the UK is something every road cyclist should complete. You’ll journey 1,000 miles through three countries, on a route that winds its way along lesser-visited roads. Look forward to eating up the miles as well as our legendary lunchtime picnics. Be seduced by the ever-changing geography, flavours and culture of Spain. You’ll ride through no less than 14 natural parks as well as beautiful towns like San Sebastian and Ronda. The stunning hotels, al fresco lunches and fun-loving locals make this a holiday you’ll never forget. 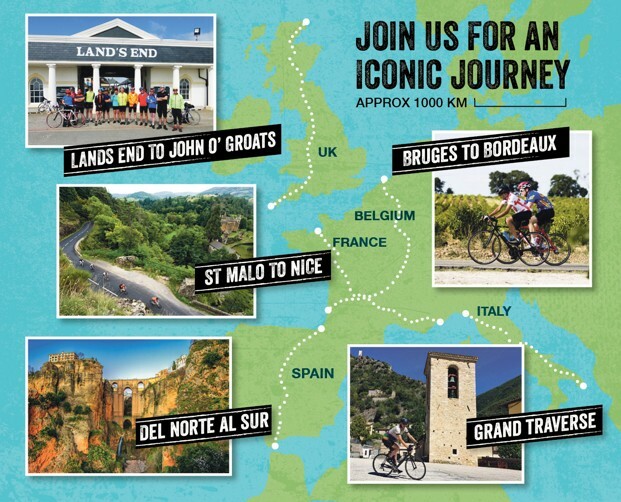 One of our most popular iconic journeys offers you your very own Tour de France experience. Cycle ‘Channel to Med’ for your chance to soak up all of the beauty France has on offer. You’ll discover its true heart en route to Provence, all washed down with world-renowned wines. If you haven’t booked yet, be warned, as places are filling up fast. As well as the classics we’ve featured above, don’t forget about our popular Grand Traverse route through Italy’s sumptuous landscapes, and our fab new border hopping journey: Bruges to Bordeaux.